Last Saturday was the first summerly day in the Netherlands. Lots of sunshine and a great day for sketching outside! 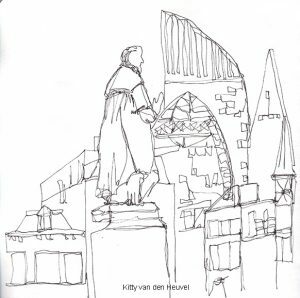 The first sketchday of this year organised by the Urban Sketchers Netherlands. 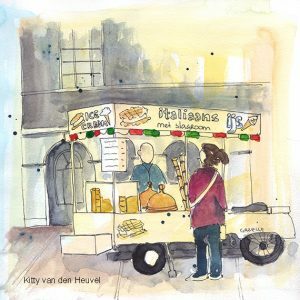 This time in The Hague. It was a lovely day, great to see old friends and also to meet new sketchers. 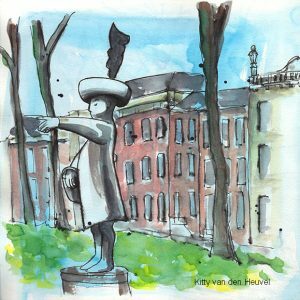 I started with the statue of ‘Jantje’, he is the subject of a Dutch childrens’ rhyme and lives in The Hague. He is pointing at the Binnenhof, where the parliament of the Netherlands is housed. After lunch on a sunny terrace at the Plein, I moved to the Binnenhof. Roberto, the Italian ice cream seller was also there. He did good business on this sunny day. And his ice creams are lovely! As I talked to a lot of friends during the day…. and only did 2 sketches, I did this continious line drawing in 5 minutes, waiting for the group picture to be taken.